Dime has just left her career as a Ja-lal Intelligence agent, ready to roll her own dice. When, instead, she’s accosted by winged invaders, some truths quickly fade—while others solidify. Begin Dime’s journey with this unexpected tale of pursuit and discovery. Please note this is a novella-length title, and, while the content is appropriate for YA audiences, it is not presented as a YA title or for YA reviewers. This is not a romance title - it is more centered on identity and friendships. Opening a new book is like beginning an adventure to me; and Escape (Diamondsong 01) did not disappoint me! Within the first few pages I had a strong sense of who Dime is as an individual, and was off on an adventure with her. While that adventure was confusing and alarming to Dime, to me as the reader it was exciting and interesting, and each page made me want to know more about her and her world; and the other characters in her world. By the end of Escape, I knew just enough to make me wish that Diamondsong 02 was already in my hands! I recommend Escape to anyone who loves a good adventure and to everyone who likes fiction, especially fantasy fiction. 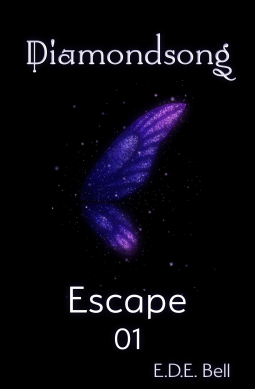 Escape is Part 01 of the ten-part epic fantasy novella series Diamondsong, with releases concluding in 2020. Diamondsong experiments with form and genre. In addition to its Act and Interlude composition, it contains progressive gender themes and employs both non-binary and neutral gender pronouns. The plot is character-driven and thoughtful, not action-based. Set in an inherently vegan world, Diamondsong features an intentionally low level of violence, seeking not to rely on violence to drive tension. Atthis Arts seeks reviewers open to Diamondsong's serial format and experimental elements. It is novella-length, and it is not intended to be reviewed for YA or Romance markets. We thank you for your interest. We ask you not to be dissuaded by the negative early reviews - the title was picked up by YA reviewers who might not relate to some of the themes. We've tried to make that more clear in the notes, and we appreciate your interest in a title of which we are very proud. After reading E.D.E Bell's stories i really wanted to read this one too. It is interesting to read. I really like the story. There is a guidline in the beginning and that is really useful too. The story is unique and i am definetely going to read the part 2 too.